Ask DN: Sooooo… iOS 7. Thoughts? My first impression: it seems like a pretty uninspired reskin to use "flat" design. The UX/interactions are wonderful and stunning. I think the bright colors are great. In all honesty, I really hope to grow to love iOS 7, and I'm sure refinement will take place as the launch date approaches, or at least expected in iOS 8. I shall not comment on any interface redesign before actually using it. I shall not comment on any interface redesign before actually using it. I shall not comment on any interface redesign before actually using it. I shall not comment on any interface redesign before actually using it. UX looks lovely, can see that from demo videos - but yes can't truly understand it until using it - but you can easily judge UI elements and some visual design. I don't think anyone really wanted flat. I never wanted flat, and I think most people, while making a huge deal about the rumors, didn't really want it either. I would love an overall step in the minimal direction, but not a flat UI. And this is poorly executed regardless of where you stood on the matter. I dont think its "that" flat! Flat for the sake of flat. Sad to see Apple make such a rookie move. I'm quite positive to be honest, it contained the amount of refreshing as I'd hope for and the room for improvement that will drive the next few updates. Visually there are flaws, but that is to expect from a concept that has been rushed so much. I like the updated of interaction, despite where they borrow inspiration from. The OS feels lighter, more modern, and will for sure keep us busy for a while to accomodate our projects. The whole "flat for the sake of flat" I don't agree with. It was the expected move, especially since Ive took over. To unify the philosophy of Hardware and software design, it had to go this way and dictate the vision of iOS instead of the chaos that drives it now. It certainly does not feel "new" in some ways. Apple has certainly followed what many people call "flat design" (which is such a dead horse at this point because flat design is an incorrect label, either way I see nothing there I haven't seen already in use these days in terms of flat, simplistic, minimalistic, clear, etc. design). The layering of the interface elements certainly adds an interesting aesthetic, but something I would need to use to love or hate. The icons I'm rather indifferent on, as the gradients on some are just "off". Apple is following on this design, not leading -- and that worries me. (My paranoid self fears that the good aspects of simplistic clear design will become Apple IP, just all those gestures they didn't invent did. That could push GOOD design that uses clarity into tight positions down the road). It feels "new" in that it is different from iOS 6, but it is not "new" in the way that something is neatly wrapped up and packaged. It feels more like an iterative stage towards what could be a very interesting design direction. Perhaps iOS 8 will clean out the cobwebs and really shape this new foundation into something worthwhile. Brett J., is super right in that we are going to have a schizophrenic UI for a while until all the apps change their tune. I wonder if Apple's App Store guidelines will crack down on non iOS 7 friendly designs? Control Center seems.... cramped? unfinished? There are some great features, and nice affordances with regards to the transitions, animations, and parallax effects that will probably get overlooked in the polarising visual style. I'm sure with time and iteration it will get more polished - in the short term, it certainly causes a major disruption to the majority of 800,000+ third party apps, which will need to update not just their interface but also their icon to feel consistent with the new visual style. As such, we could be living with quite a visually fragmented operating system for some time. This is the problem with looking at static images of an interface. Sure it looks unfinished graphically, but the transitions and animations are absolutely stunning. I think a year from now we'll be looking back upon iOS 6 as a really archaic feeling interface. iOS 7 just looks so fluid in comparison. That said, the blurry transparency, neon colours and thin fonts everywhere are not to my taste at all. It looks garish and a bit nauseating. Maybe seeing it in person on a retina screen will change my opinion on that but for now I'm not a big fan of it visually. Disappointing to see apple so deeply influenced by the design community. The designers that work there are part of the community, they don't work in a vacuum. That said, if you look back maybe a decade or slightly further, you can see that Apple were really in control of their entire aesthetic. Aqua appeared to come from nowhere - I can't remember anything that looked similar. For several years after Aqua dropped, Mac app design generally involved simply following Apple's guidelines. Apple led and (many) designers followed. This has all changed substantially over the past several years. It's now much easier to create web/mobile apps in which a designer has the ability to craft the entire experience. Designers can roll their own user interface elements. I think we forget how uncommon this was even eight or nine years ago, when the conventional wisdom was that good design involved following the platform's established standards. If you were building an app for OS X, it had to look like an Aqua app etc. Broadly, I think that these shifts mean that designers can now out-design Apple, whereas they couldn't a decade ago. Apple is still an influencer, but their design aesthetic is now also being heavily influenced by those outside the company. I do think that's new. Apple has been known, and loved, by us for their history of leading and inspiring the community, not following it or it's monthly/yearly trends. Big yay for animations though. Motion designers are the new secret weapon of UI. There's a lot of snap judgements going on. Either download the beta and try it on for size, or wait until "Fall 2013". No sense in faulting the car before you take it for a test drive. iOS 7 is an Oreo of unbelievably delicious filling sandwiched between two somewhat bland cookie crusts. Can't I just eat the middle? I don't think Apple executed the same "flat" as we refer to it around here. Frankly the stock app icons are atrocious. That being said, I'm looking at my homescreen now and the only stock apps that aren't stuffed in folders are the Phone and Messages apps - so maybe it'll be alright, after all. It's not even "flat" design though. There's random 3d elements, random gradients, just 80 different styles of design thrown into a blender and vomited onto the screen. I think its fine. But exactly that. Fine. It's ok. No breaking boundaries, safe, predictable, something that Apple has become. A parody of itself. No longer breaking new ground but trying to catch up with the cool kids. Jonathan S said: "iOS 7 screams California+Hollister+Flip flops+Glitter+Ke$ha" and its totally that, promoting a lifestyle thats safe and preppy. Personally, I detest that lifestyle but know that some people buy into it. Yet I find this is happening across the industry and now Apple has brought it home to the masses. A shame, but, you know, its fine. I really like it. Definitely easier on the eyes. The interactions look great too. Feels like there's a bit of fine-tuning going on as far as experience goes. Can always appreciate that. The changes are a nice group of additions and improvements to an already pretty sweet mobile operating system. This ought to tran$late well. Can't agree with the "Flat for the sake of flat" comment though. Flat design tends to look pretty good if done correctly. I'm glad a company as big as Apple has the humility to recognize something like that. Yeah, the icons look amateurish, and naked text buttons are iffy at best. But functionally, it looks like a great improvement, and includes a lot of big asks that have long been gripeworthy parts of the iOS experience: new multitasking UI, multiple pages in folders, quick access to settings, better photo organization… They're clearly listening to their users, and while it's a little scary to see Apple making things fresh just for freshness' sake (indeed, it's a little scary to see Apple looking less than fresh), it's remarkable how DN, a site that just weeks ago said "flat isn't the point, it's about function" seems to be missing the big feature improvements present here. And I like some of the UI. Sure, there are still gradients, and the colors aren't drawn from LayerVault/Google's trendy palette of chalky primaries. But there is a lot of subtlety here, too: the 3D effects, the slight textures, the more depthy, physical sense of movement and animation. It looks like they've collected all the good stuff from other apps and other platform. Their calendar app is based on Sunrise, their email app is based on Mailbox app,... The transparent status bar is based on Windows Phone, multi-tasking is very similar to Android, even the bokeh background image is very similar to Android's. Safari's tabs is quite similar to Chrome's interface, quic access settings is exactly like Android,... and finally flat design was... introduced by Microsoft. I have to say that overall the redesign is a good step towards simplicity. Its definitely a great improvement over the previous design. I agree with some of you that the icons and specially the frontpage and control center pages need to be tweaked for sure. I'm hoping with the future it would improve. Boring. Odd colours (too girlie for me!) - no customisation options other thn backgrounds, a few jailbrake-style tweaks (control centre - auxo, etc) and more of the same.. it's still just a long list of apps. Yes, I think most of us agree that they made some questionable design choices, but... would you still use it? Will you still upgrade when it gets released? I think the interactions and new functionality alone warrant an upgrade, awful icons aside. Initial thought: It’s a hodgepodge of every mobile OS, and the icons are (mostly) atrocious. We asked for flat, but they tried so hard not to underwhelm that the result of their product is a strange bastardization of flat and what I'd call "almost flat." The gradients and color palettes used are seizure-inducing and harsh on the eyes. Not to mention that some basic design implementations in their new overlay/glass interfaces like Control Center obfuscate reading of their thin white text. They could have done more to make the entire environment look a bit more cohesive. Looked like they had teams sit in different corners of the room and design out an icon and then they sorta came back together and put together somewhat similar UI elements in the app. bonus positive comment: I like the colour palette, not pastels but bright and cheerful enough to differentiate against googles stuff! Feels like the did it to be trendy. While many things are improved, overall it feels over-saturated, one-dimensional and too empty. It looks like the smashed Windows Phone and Android together rather than inventing or pushing a new design style with their own personality. I am not completely disappointed but I am not excited either. I hate it but because it's Apple, I must love it. I liked the new multi-tasking interaction. Swipe left/right to move through them. Swipe up to get rid of one. Weird that they didn't carry it over to Safari... would have thought they would keep it consistent. Hard to say till we try it out. If this is something useful, easy to understand and design is secondary, then they did a really nice job. And for people claiming that there are girly colors, I don't concur. Just for yalls amusement. I was looking at the apple developer guidelines for UI last year when doing some research on icons and icon design. They are interesting to look at if you haven't seen them before and before they update them. I am curious to see the new ones and how they describe them in the context of guidelines for developers. "Portray real substances accurately. Icons that represent real objects should also look as though they are made of real materials and have real mass. Realistic icons accurately replicate the characteristics of substances such as fabric, glass, paper, and metal, and convey an object’s weight and feel. Use transparency when it makes sense. Transparency in an image can help depict glass or plastic, but it can be tricky to use convincingly. You should not use transparency in your app icon." I am hopeful and excited from what I saw today, not because of what details we got a glimpse of, but rather a bold new vision for where iOS is going. Like or hate what you saw today, one thing can't be divorced from that argument, and that is that Jony Ive loves to tinker with his work, never happy with things and always looking for new ways to improve things. Look at any of his amazing contributions, be it the many evolving iterations of the iPhone, to the vastly changing iMac over the years. I am not going to pass judgement, praise or critique, until I actually get to play with it in my hands as it is intended. But what I can do is be excited for what I see to be a fresh coat of paint that sit on top of some insanely impressive new features. All of which we can be sure that Jony Ive will do everything he can to continually improve over the years. If it looks this bad on the white iPhone, imagine how it'll be on the black one. It would be a nice touch to invert it for each one. — Anyway I think it's a definite improvement in the way it works.. I look forward to it's release. You can in iOS6, but it's kinda hacky – and you need to be fast. I'm done with the 5 minutes test. But it'll take me 5 months I think to like it. Overall: UX is improved by using better animations and various small changes. (App) icons are bad. They look like draft design proposals. The colors are too childish. I hate the term flat design. Flat is just a trendy term and should not be the reason to create a design like this. Simplicity is key, but I think a little bit more detail had been better. Apple should have known better. My only issue is that Apple seems to be accepting the fact that their brand has been co-opted by the hipster chic movement, and embracing that in their design and marketing. I worry that this will be the turning point at which iOS becomes the "hipster device" in marketing and design. I just don't see the "Think Different" anymore within Apple. Google could very well pull off this interface and I wouldn't even be impressed. Apple is usually one step above the rest, you can taste the difference. Just not this time. Well, these conversations look familiar. Just before release of Windows 8/Windows Phone 8. So now, I see the same conversations on iOS. So I believe they both think like: "Don't waste time with the icons, just make good transitions"
We used to look up to Apple, all of us who design on the web. I think that's changing slowly. So much of the UI is amateur at best, it's inconsistant, ugly in places, hard to read, and just not Apple. Those icons?! Seriously?!! The new Mac pro brea,s down every block, no copying at all, just how do we build this product for its purpose. It's 100% original and a phenomenal piece of design. This was how I felt when the first iPhone came out, but this iteration I just feel let down. I don't think it will be long until we stop looking at Apple for inspiration and it will be people like Google. (How good were the new guidelines?!) I really hope I'm wrong, I love Apple, it's all I use.. but I don't feel as attached after this on the mobile front anyway..
Really reserving judgement till I see it. There is a lot of hyperbolic criticism coming from designers, which is somewhat ironic. My first impressions? I think the colour palette does the preview no favours. 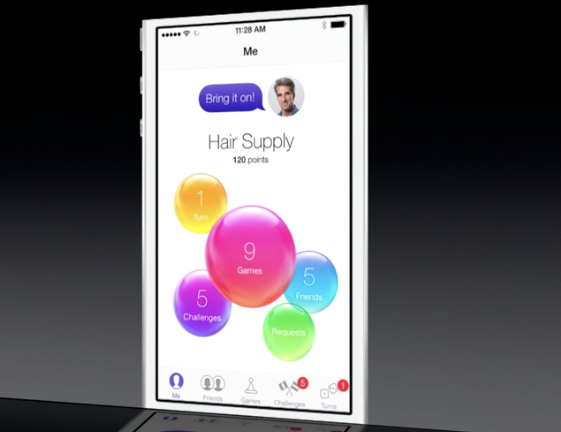 But Apple has been using colours a bit more actively after they sort of disappeared from any hardware. With the colourful iPod Touch hardware and smart covers, I'm curious if there is somewhat of a 'hardware-software' rationale....doubtful though. I'm a cautiously optimistic that iOS7 coincides with a gradual shift in some of the iOS interaction models. There were some interesting functional design changes made and the highlight of a z-axis (which I didn't catch on to till I read Gruber's article) is really interesting to me. A lot of the interaction work looked really great. I look forward to September. I assume we'd get new devices to coincide with the launch of the OS. If there's a significant iPhone change, I think iOS7 has foreshadowed some of what we'll see in a 5S/6.